I love my travel self, I love the kindness of strangers on the road and I love the challenge of trying to capture something so ephemeral on the page. If I do it right —if I research like an historian, investigate like a journalist, question like an essayist, understand like a sociologist, paint character and place like a novelist, tell story like a griot, craft metaphor like a poet, making meaning like a memoirist— it has the potential to change someone’s understanding of the world. And I’m changed too. Faith Adiele , travel writer. Sharon Olds said something beautiful about sometimes thinking of her poems as instructions for how to put the world back together if it were destroyed. From Amy Heppel's interview, with Paul Winner, from the Paris Review where she said so much that was wise and beautiful. Her love of life and courage was a lesson to me, everyday. She sent out these tweets almost daily, her lessons of life and death. Make the most of this day. Whatever that means to you, whatever you can do, no matter how small it seems. Find a bit of beauty in the world today. Share it. If you can't find it, create it. Some days this may be hard to do. Persevere. Saturday, I reread this book and realised all over again, how beautifully written it is while remaining a tale so powerfully written that it destroys me each and every time I read it. Mornings in Jenin, by Susan Abulhawa. It's worth seeking out. Meanwhile, I'm enjoying this song by Andrew Belle as I listen to music here ... reading and writing, taking notes, enjoying the weekend ... at last. I have a new interview up in my Interviews section. Nina Coolsaet is the loveliest Spanish-based Belgian who, together with her Spanish husband, Alfredo, is breathing new life into the old family bodega and creating some head-turning wines. I had the pleasure of interviewing her a while ago. 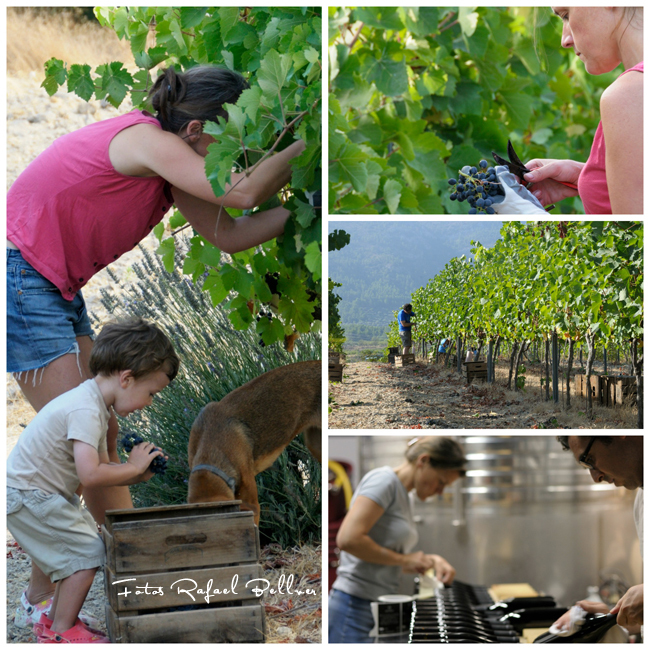 I was curious to know more about this couple who were all about creating wine with their family in mind. I imagined how that might affect the way you would produce a wine. The photographs were provided by Rafael Bellver and I have created a slideshow of his images over here. This man's poetry ... it needs sharing. Neil Hilborn has OCD and he performed this poem about how his love life impacted it—and how it impacted his love life. I must share ... my favourite New Zealand radio personality, Kim Hill from NZ National Radio, interviewed the Man Booker Prize winner, Eleanor Catton. I knew Kim would have done this thing ... a 41 minute interview, that really explores Eleanor's life and work. Thank goodness for Radio New Zealand's archives. So many treasures found there - Sam Hunt is another special NZ love of mine. win the presitigious literary award. She is also the youngest short-listed writer in the competition's 45-year history. The prize, announced at a ceremony in London, carries a cheque for £50,000. The Luminaries is a murder mystery set on the West Coast during the 1860s gold rush that relies on an astrological narrative. It follows in the footsteps of Mr Pip by Lloyd Jones, which was shortlisted in 2007, and The Bone People by Keri Hulme, which won in 1985. Here's a collection of Radio New Zealand's interviews with Eleanor Catton from recent years. Hanna and I explored the possibility of merging our interest in people with my passion for interviews and photography and her talent for film back in July. New Zealand artist, Wendy Leach kindly agreed to be the subject of our first combined effort and while you don't hear or see me, that's me doing the interview. Following is the 7 minute interview we created. Interview with artist Wendy Leach from Wendy Leach on Vimeo. Full interview with artist Wendy Leach from Wendy Leach on Vimeo.